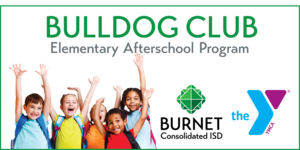 In preparation for the 2019-2020 school year, the District has been working to finalize plans for the Bulldog Club Afterschool Program. We are excited to announce that the Board of Trustees approved the YMCA of the Highland Lakes to take over the operation and management of the District’s afterschool program. Please read the letter below for complete details.